Here I am at the show in Fallbrook. It’s raining outside. I was setting up during the rain. Today, the forecast is more raining. We need the rain. I love the fact that this weekend I’m doing an indoor show! Vodka Tango Foxtrot? There has to be an explanation…. Vladimir Putin is going to be paying us a visit [with a large entourage, I’m not suggesting he’s an alcoholic]. CVWD (the local water company) keep asking us to cut back on water consumption so to help they are providing us with a cheaper alternative. This year’s batch has a special ingredient that makes people actually want to vote. Once we all discover it doesn’t taste quite as good as Budweiser/Coors/PBR/Corona, we’ll just go pour it into the Salton Sea, and the problem of the falling water level will be solved. The local meth chefs decided to switch to moonshine and ‘acquired’ the bottles. Newer Work #12 – reminder to save water. For those of you outside California, we’re having all sorts of water usage restrictions because of the drought. It’s not just the last few months, it’s been dry for years. Although we’ve had a couple summer storms, which is a little unusual, they seem to get other parts of the Coachella and Imperial valleys, leaving Salton City dry. A few days ago there was a storm here, but on the other side of town. My house got dripped on, that was it. #1151 Gentle Storm. Mixed media on panel: refractured watercolor, acrylic, poem. 12×36″. $750. “Dawn at the end of an era”. Acrylic on gallery wrap canvas 12×12″. $120. The Salton Sea is in the news a lot these days – it’s about 4 ft lower than when I first moved here almost ten years ago. The foundations of the old yacht clubs that were flooded in the dual storms-of-the-century in the late 70s are now visible. The boat launch area from which a friend and I once paddled a canoe, is now an almost dried up inlet sporting only a large puddle. I’m glad I took photos back then, they are already historical. 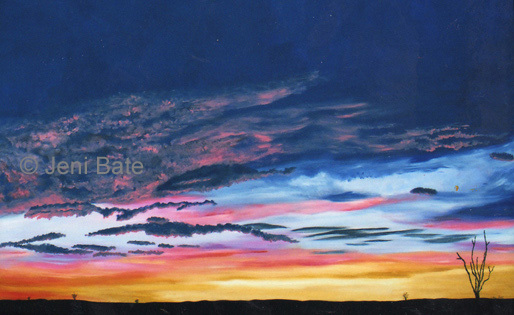 Sometimes when I paint from them I wonder if I will still be able to see the sun rise out of the water at winter solstice throughout my lifetime. Perhaps, perhaps not. 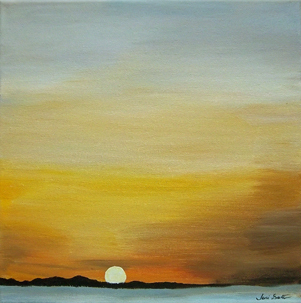 This painting was created based on one of those old dawn photos. I titled it to reflect that. Is that a start eyewall?? This time last week I was at my mother’s house in Wales. It rained. I was there for seven days and it rained (at least a sprinkle) for five of them. On the Tuesday night, it poured, and I was sleeping in an upstairs room that is partly under a flat roof and I could hear the rain delightfully. I was happy to see lightning across the sea when I looked out the window this morning at about 4:30. I spent some time attempting to photograph it – my digital is not up to the task so we will see when I get the film back whether I had succeeded. Accuweather and NOAA had been promising the possibility of rain and this morning there was a brief shower. I regret finishing the task I was on before going out to dance in it, because it only rained for about three minutes, and I was too late. This evening, there is a continued promise of rain – but as we are so far from any hills, it’s really just vague maybe. 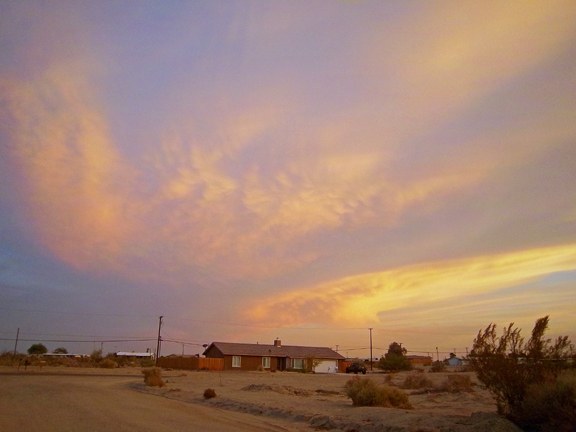 I did step outside once I saw the sky colors – now this is an interesting formation. Looks like the beginnings of an eyewall…. we don’t get those around here. I hope. But it will likely be the precursor to a painting. At least if the rain stays away we will have a meteor shower instead tonight. Three times is a pattern…. I spent a lot of time poking water out of the awning, which doesn’t slant enough for runoff, but the tent top and see through tarps kept everything important dry. They say that ‘once is one thing, twice is a coincidence, but three times is a pattern’. Well I’ve noticed of at Big Bear shows. I’ve shown there four times. The first time, the weather was gorgeous, if a little toasty, and I sold to people who lived in ‘down the hill’ in Orange County, LA County and San Bernardino County. The second time, we were threatened with 15% showers. 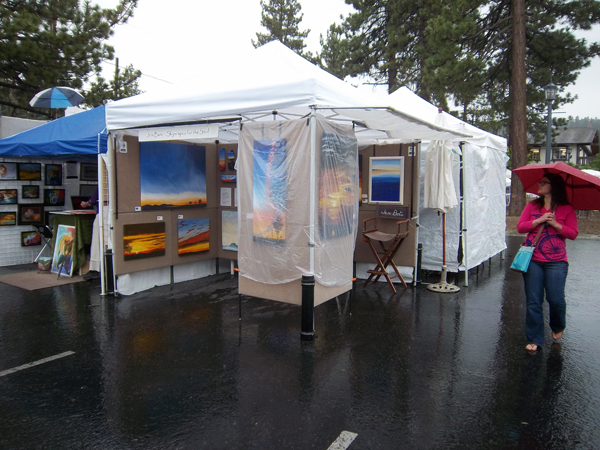 I sold one painting to a local, it poured for two hours and flooded us out and I packed up in disgust and went home. The third time, my fans came from the Desert, Riverside County and San Diego County. We were promised 30% showers. It hailed for 15 mins, then rained for the balance of five hours. This year, we were promised perfect weather – until the day we went to set up. On Friday it poured for 30 mins hard, on Saturday we had an earthquake followed by 2 hours of solid rain and both roads out were at times blocked by landslides as a result of the combination of both. We needed the rain, just not that weekend!! !My new fans were from San Bernardino, the Desert, Orange County and San Diego. Conclusion – stay down the hill and do more shows on the coast during the summer! 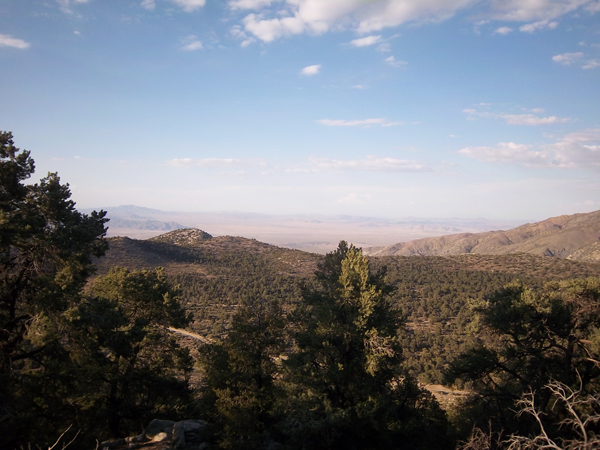 It was nice to get this view on the way home and know that the steep windy hairpin stretch that I hate driving only lasts five miles, and that I will never*** have to do it again.